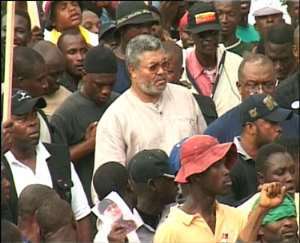 Accra, June 3, GNA - Thousands of people on Thursday rushed to catch a glimpse of former President Jerry John Rawlings and Professor John Evans Atta Mills, the Flag Bearer of the National Democratic Congress (NDC), when they arrived at the Gbese Mantse's Palace to witness the lifting of the ban on drumming and noisemaking in the Ga Traditional Area. The large crowd carrying umbrellas and wearing scarves in NDC colours drummed, danced and shouted "J J - JJ - JJ - Second Jesus", as the two went to pay homage to the Chiefs and elders of the Ga Traditional Council, (GTC). Numo Tete III, Naa Wulomo, Chief Priest of the Gas, poured libation followed by drumming and intermittent firing of musketry to signify the lifting of the ban amidst singing, clapping of hands, jumping, shouting and dancing. The number of NDC supporters was more than those of the New Patriotic Party (NPP) making it seem as if the occasion was an NDC rally. Government functionaries including, Mr Jake Obetsebi Lamptey, Minister of Tourism and Modernisation of the Capital City; Sheikh Ibrahim Codjoe Quaye, Greater Accra Regional Minister; Nii Adjiri Blankonson, Mayor of Accra and Reginald Ayi-Bonte, Member of Parliament for Odododiodioo Constituency, who were also present loked on as the former President responded to the cheers by raising his clenched fist. Nii Teiko Tackey, an Opinion Leader, told the Ghana News Agency that it was the first time the former President had come to witness the ceremony. He said the ban was imposed in May 3 in order for the Elders to fast and reflect over past events and for the people to change their life for the better, adding that during the period prayers were said for the atonement of sins and adequate rainfall so that they would be a bumper harvest of corn and millet. He said the lifting of the ban preceded the Homowo festival, which would be celebrated in August.